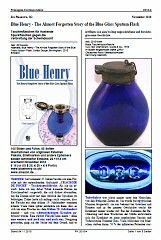 A compiled list of articles written by Ivo on Blue Henry. A short article was written by Ivo for the well-respected Pressglas Korrespondenz, Winter 2010 issue. The Friends of Broadfield House magazine, due in December 2010.